This stunning beach is probably best known for its appearance in the opening scene of the 1969 On Her Majesty’s Secret Service, featuring Aussie Bond George Lazenby. George pulls up in his Aston Martin, only to spy Diana Rigg wandering into the sea in an apparent suicide bid. Naturally, he dives in to save her, only to find himself fending off two hoodlums using nothing but a handy anchor and a fishing net. Because, you know, that’s what Bond does. Being housed in a nature reserve, the beach has changed little since 1969, although you’re unlikely to find any secret agents or henchmen running about these days. You will find some excellent seafood restaurants, however, and the rolling waves and stiff breeze make this a hot spot for surfing (the World Windsurfing Championships are often held here). The nearest town is Cascais, about 5km away, which is a popular vacation spot for both Portuguese and foreign tourists. The ‘beach of the rocks’ is a great place to hang out if you want to avoid the crowds of the Algarve - even at peak times you should be able to find a good spot on this huge expanse of sand. A rocky headland divides the beach in two, and there are plenty of small caves to explore along the cliffs. It’s also fairly sheltered, so it makes an ideal place for sunbathing and swimming. Nearby Portimao has plenty of restaurants and bars for apres-beach relaxation. The 3km of wide sands at Praia da Bordeira are a beach walker’s paradise, and this vast stretch of sandy coastline rarely gets busy, unlike some of the more touristy beaches dotted around the Algarve. Pack your sturdiest flip flops and stroll to your heart’s content. Be warned though: there’s little in the way of amenities along the beach, so remember to bring a packed lunch. It can get a tad windy too - good for kite-surfing but not so good for sunbathing. The nearest village is Carrapateira on the Atlantic coast. The striking cliffs of this tucked-away beach provide it with a sense of seclusion that can be hard to find in the Algarve at the height of summer. The beach was once overlooked by a fort, hence the ‘castelo’ in the title, and it consists of several small beaches interspersed with rocky coves that are ripe for exploring. Praia do Castelo can be found just over 6km from Albufeira, but despite its proximity to this the popular tourist town, it’s rarely visited except by locals and more adventurous travellers. This is the one for romantic sunsets. Take a stroll along the shore and sink into your loved one’s arms as you watch the orange sun plunge into the Atlantic waves, which crash against the formidable, jagged rocks offshore. Then head off to the renowned seafood restaurant tucked under the cliffs to get bladdered while eating clams. The nearest town is Almoçageme, which is around 40 km from . This stunning beach, surrounded by towering cliffs and azure seas, was voted as one of the 10 best beaches in Europe by the Michelin Guide. Once you’ve tottered down the stairs from the clifftop above, you’ll find yourself in a snorkelling haven, with plenty of nooks and crannies to explore under the clear waters. Boat trips are available too, so you can investigate the many nearby caves. You can find this phenomenal beach on the Algarve coast, just east of Carvoeiro. This beach on the island of Tavira can only be reached by a ferry from Tavira city on the mainland. The island is only 11 km long and just one across at its widest point, with most of its area being taken up by this huge beach. Naturists are welcome too, so don’t worry if you haven’t packed your swimming cossie. If you fancy staying over, there’s a camping park, but otherwise there are scarcely any buildings on the island - those that exist are banned from being sold, and there’s a moratorium on any new construction. 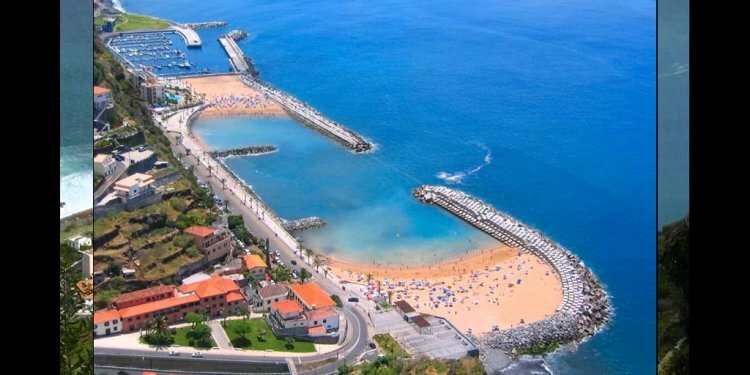 The seaside town of Zambujeira do Mar is situated on a rugged stretch of Atlantic coastline around 70km north of Lagos. There are numerous small beaches tucked away along the rocky cliffs, which attract surfers and backpackers alike. In August the town gets into party mode in preparation for Festo do Sudoeste (Southwest Festival), which has previously played host to the likes of Fatboy Slim, Snoop Lion and The Vaccines. This beach might not be the prettiest, biggest or quietest on our list, but it deserves a mention because in July it will be home to the 2015 FIFA Beach Soccer World Cup. From 9th to 19th July, teams from across the world will descend onto this golden beach to decide who is currently the best country in the world at hoofing a ball about on sand. Brazil is the dominant force in the bi-annual competition, having won 13 of the 17 tournaments so far, although Russia took the most recent title in 2013. Intriguingly, landlocked Switzerland were runners up in 2009, showing that a notable lack of beaches is not necessarily an impediment to being good at beach soccer. Praia da Baía can be found in Espinho, just south of Porto.